A case contains 12 breakers. 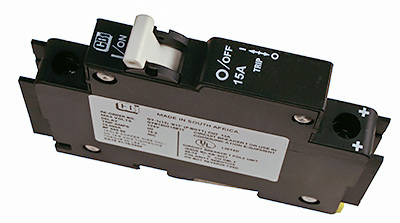 Description: 150VDC din rail mount breaker (13mm wide). Gray aluminum type 3R rainproof enclosure with insulating dead front, will accept six 150VDC breakers or 4 600VDC fuse holders. Gray aluminum type 3R rainproof enclosure with insulating dead front, will accept 12 150VDC breakers or 10 600VDC fuse holders.